Katz says Flanagan disrespects low-income defendants and has violated ethics laws. But Flanagan and her supporters think she's being targeted because she's a lesbian. Karen Katz (left) and Tara Flanagan are locked in a bruising campaign. Tara Flanagan handily prevailed in 2012 when she first ran for Alameda County Superior Court judge. The former-prosecutor-turned-domestic-violence-survivor's advocate won just over half of the vote against her two opponents in the June primary. And then, like most judges, once she donned the robe, Flanagan didn't think she would ever have to defend her seat. She figured she'd be able to run unopposed in 2018 when her first term was up, as most judges do. So, earlier this year when former Alameda County Deputy Public Defender Karen Katz filed to run against her, it came as a complete surprise, Flanagan said. But Katz said it shouldn't have surprised anyone. A retired public defender of 30 years, Katz came out swinging against Flanagan, saying the incumbent judge personifies the cold and callous nature of a courts system that's not fairly serving low-income families and communities of color. Lots of judges are former prosecutors or business attorneys who don't know how hard it is for the working poor to navigate the courts. Katz thinks some judges run their courtrooms at too rapid a pace and don't treat everyone with the respect they deserve. And Katz also decided to run because state elections officials found Flanagan committed a major ethics violation to gain her seat on the bench. "Judges need to be compassionate and fair," said Katz, in a recent interview. "They should level the playing field regardless of a person's race or socioeconomic class." Katz alleges that Flanagan has disrespected the accused and jurors and undermined defense attorneys. Flanagan counters that nothing could be further from the truth and calls Katz's allegations baseless. "When I first started out, my first couple years, I was trying to stress civility in the courts," Flanagan said in an interview. "I was shocked at the time by the level of rancor between attorneys." Flanagan said one strategy she employed to try to cool things down in her courtroom was telling prosecutors and defense counsel that they were each other's "colleagues." It was a way to remind them they were officers of the court with a duty to serve justice, not to attack one another, she said. Some attorneys bristled at the term, however, especially defense counsel. According to Katz, it undermined lawyers in the eyes of their clients who were led to think their attorneys weren't really on their side. They were too chummy with the prosecutor — their "colleagues." There were other little things Flanagan said she did to create a more civil tone in her courtroom, including using the term "guest" to refer to prisoners in custody of the Alameda County Sheriff's Office. "Bring out our next guest," is something she'd tell the sheriff. Katz said the term came across as a pejorative and trivializing. It was inappropriate because some inmates are detained for weeks or months at a time while their cases are argued, due to the fact that they don't have enough money to post bail. Jail, for them, is nothing like a hotel stay. "They're not guests," said Katz. Flanagan said she thinks "guest" is a more compassionate term than "defendant." And the court's new computer system, Odyssey, is so buggy it often doesn't name the next person on a docket. "There's no derision in it," said Flanagan. But Flanagan's biggest weakness, and a major reason that Katz says she should be replaced, stems from a campaign finance violation. During her 2012 campaign, Flanagan accepted two checks for $10,000 and $15,000 from her friend and campaign treasurer Carol Pranka made out to Flanagan personally. Flanagan deposited the checks into her law office's business account and then loaned her campaign $25,000. The maneuver effectively masked the real source of the money, which amounted to 23 percent of Flanagan's campaign funds. State Fair Political Practices investigators concluded that "Flanagan was an attorney who should have understood that her actions, and the actions of her treasurer, were contrary to the [Fair Political Practices] Act's promotion of transparency and truthful reporting." The Commission on Judicial Performance concurred and admonished Flanagan. Flanagan and her campaign treasurer said they were unaware of the law. The FPPC said the two fully cooperated with the investigation. In the end, they were fined $6,000. Katz says it's ironic that a judge would plead ignorance of the law to excuse her actions. Even so, many elected officials and organizations appear to be unphased by Flanagan's campaign finance violation. Flanagan has been endorsed by both the state and Alameda County Democratic Party, Assemblymembers Rob Bonta and Tony Thurmond, Congressmember Eric Swalwell, and Oakland, Berkeley, and Emeryville's mayors, among many other politicians. Flanagan also has support from police unions and her fellow judges. According to campaign finance statements, unions representing cops in Oakland, Fremont, Newark, and the Alameda County Deputy Sheriffs Association have contributed a combined $7,500 of the total $52,111 she's raised over the past year. Katz's supporters include a large number of current and retired public defenders. Flanagan and her supporters say she brings much-needed diversity to the court. When she was elected in 2012, only 30 percent of the Alameda County Superior Court's judges were women. Flanagan is also a lesbian, and she said that she's felt the sting of discrimination — a feeling that has informed her approach to being a judge. Flanagan and some of her supporters have also tried to characterize Katz's campaign as an attack on LGBTQ people. 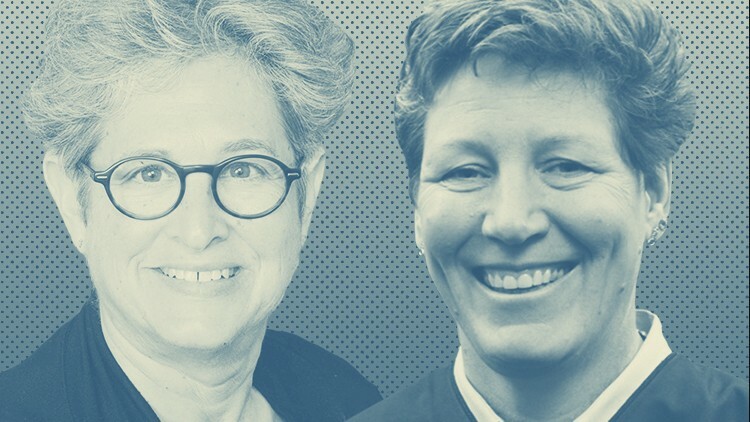 "Of all the diversity that could have been challenged for a judicial seat this term, only I, an out lesbian, was challenged," Flanagan wrote in response to a question on the East Bay Stonewall Democrats' endorsement questionnaire. The East Bay Stonewall Democratic Club, which endorsed Flanagan, issued a public statement in February "denouncing" Katz's campaign. "We are shocked and saddened that the very same ballot box that was used to empower the LGBTQ community is now being used to disempower us in the Alameda courts," Michael Colbruno, the group's political action committee chair, said at the time. Katz and her supporters said the implied message is a false, "reckless accusation." Katz, who describes herself as a bisexual woman with a gay son, even wrote on her campaign website that Flanagan's statement could amount to a violation of the California Judicial Code of Ethics because it is a knowingly false and misleading representation of the facts by implying Flanagan is being challenged because she's a lesbian — and not because of her ethics violations and what Katz alleges is Flanagan's disrespectful tone in court. The issue of diversity now hangs awkwardly over the campaign, but equity in the courts is about much more than the judge's race, gender, or sexual orientation. It's about how a judge treats defendants and victims in criminal cases or handles civil cases that pit tenants against landlords and employers against employees, for example. And the biggest problem with the courts in recent years isn't the background of any specific judge. The great injustices afflicting millions of low-income people and communities of color are structural and budgetary. Flanagan said she "cares deeply about equal access to justice," and that's why she serves on the board of the Alameda County Bar's Voluntary Legal Services Corporation, the pro bono arm of the bar that provides free legal aid to low-income residents of Alameda County. Flanagan also said that after night traffic court was eliminated at the Hayward Courthouse, she told the presiding judge she'd work shifts hearing cases for free. The presiding judge didn't take her up on the offer, she said. Both Flanagan and Katz admit, however, that there's only so much individual judges can do. To really make the courts fair will require the legislature to restore billions in funding and expand legal aid services and other resources. But Katz has a longer list of ideas to create more equitable outcomes for thousands of plaintiffs and defendants in superior court. At the top is bail reform. Regardless of what the legislature decides, she says the county's current bail schedule is set too high and that it has the effect of punishing the poor who can't afford bond, while also pressuring defendants to settle a case by pleading guilty in order to regain their freedom. "Alameda County needs a judge who won't use bail as a de-facto punishment of poor people," Katz said. She'd also like to see the county's courts establish a restorative justice court where victims could, if they so choose, work with perpetrators to repair relationships and heal wounds rather than just punish.